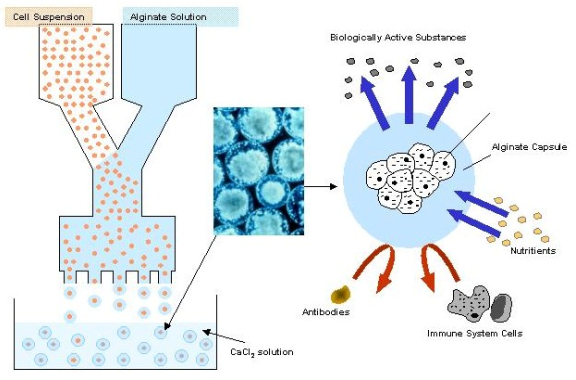 Immobilization of living cells or other biomaterials in alginate gels is a well-known technology used in an increasing number of biomedical and industrial applications. Cells immobilized in alginate gels maintain good viability during long-term culture due to the mild environment of the gel network. 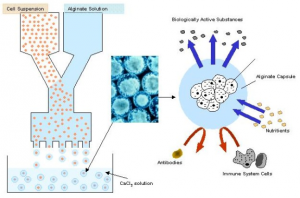 In tissue engineering applications immobilized cells or tissue can be used as bioartificial organs as the alginate gel may function as a protective barrier towards physical stress and to avoid immunological reactions with the host. 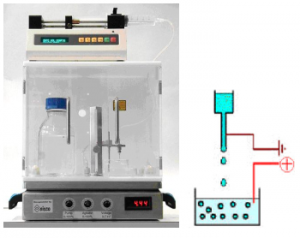 Such bioreactor systems, of which the entrapped cells are selected or manipulated to excrete therapeutic products, are currently being developed for the treatment of a variety of diseases like cancer and diabetes. For most uses, and in particular those involving immobilization of living cells, microcapsules are used. Smaller beads/capsules have the advantage of a higher surface to volume ratio allowing good transport of essential nutrients and are also less fragile. Diffusion limitations within larger beads may limit cellular metabolism as the lack of essential substances like oxygen supply to the interior of the beads may lead to cell death as a result of consumption from the surrounding cells. Therefore a good control of bead size and shape is crucial and should be carefully controlled. A suitable methodology for production of small beads under controlled conditions is therefore also necessary. The bead generators shown here are recommended alternatives for research use in the production of small spherical alginate beads containing biological materials and having a narrow size distribution. Commonly used principle for immobilization of cells in alginate beads for transplantation purposes. The beads may also be coated with other biopolymers and alginate for improved properties. 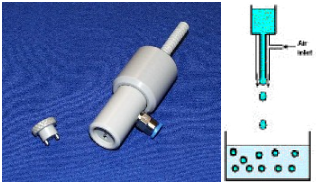 Small alginate beads with a narrow size distribution, ranging in size down to about 150 µm, can easily be manufactured by using the electrostatic bead generator. The basic principle of the instrument is the use of an electrostatic potential to pull the droplets from a nozzle tip. An electrostatic voltage of a few kV is set between the needle feeding the alginate solution and the gelling bath. The droplet size is also largely determined by selecting an appropriate nozzle size. Small size alginate beads with a relatively narrow size distribution, ranging in size down to about 600 µm can be manufactured by the use of the coaxial bead generator. The basic principle of the instrument is the use of a coaxial air stream to pull droplets from a needle tip into a gelling bath. Bead size is controlled by adjusting the solution and gas- flow rates.